When it comes to a mouth guard, also called with gums shield, there are several types which should be known and they are boil and bite mouthguards, sport combat mouthguards and custom mouthguards. All of the types of mouthguards actually have the similar ways in molding, remolding, and cleaning them. Here is the explanation in detail. How to Mold a Mouthguard? When it comes to the questions, we have to know first what is he function of mouthguards. Mouth guards are known as the important device in some of combat sports, like MMA, Battle, Boxing, even in Football and basketball. All sports which involve the direct contact toward the others usually use this devices to protect the mouth and the teeth. The rubber which is custom fit in your teeth will make the mouth guards more comfortable and safer when it is wearing. In the terms of molding or fitting the mouth guards into your teeth, here are some steps which should be known. The first step which should be known is you need to collect all of the necessary materials. If you want to fit or mold your mouth guards, you need the materials, such as: a mouth guard, scissors, a towel, a bowl of ice water, and boiling water. After all of materials have already collected, you can go to the next step, trimming the mouth guard for getting the precise and fit length. How to shape a mouthguard? You can trim the end of the mouth guard and you should ensure when you are going to mold your mouth guard, it should be fitted and comfortable in your mouth. Besides that, it also should not irritate in your mouth. If you are getting your mouth guard poking into the mouth, especially in your back jaws, you can trim the mouth guard by using scissors. When it comes to the main function of a mouth guard, this device is usually used to protect your front teeth which are quite vulnerable. However, you still have the wiggle-rooms. Some of the professional athletes tend to choose the comfortable one by using a short mouth guard which can cover the teeth. After you are getting the exact form and shaping, the next step in molding the mouthguard is submerging your mouth guard in the boiling water that you have already prepared. The boiling water is needed to submerge the mouth guard around 30 up to 60 seconds. You can start to boil water in the small stove or you can use the micro wave. How to do this step? It is quite simple. You just needs to hold the end strap of your mouth guard carefully. After that, you can submerge your mouth guard and let it become soft. If you have already cut off your mouthguard, or it does not have a end strap, all you do is just dropping the trimmed mouthguard in the boiling water and you can retrieve your mouth guard using a spoon.When you own braces, you just need to boil your mouthguard for 30 seconds. Because if you boil your mouth guard too long, it will fill in the carnnies in your braces, of course it will damage the braces. After submerging your mouthguard, the next step is removing your mouthguard carefully. Then, you should blot it quickly and adjust your mouth guard into your teeth. You should ensure that the mouth guard is not too hot. You can use the thumbs and you can push up the mouthguard. Bite the mouth guard down firmly to gain the teeth impression on the bottom. The important thing while your mouth guard is in your mouth, you need to fit it firmly and comfortably. Remember, you should not chew your mouthguard while you are fitting it. You should not move it. 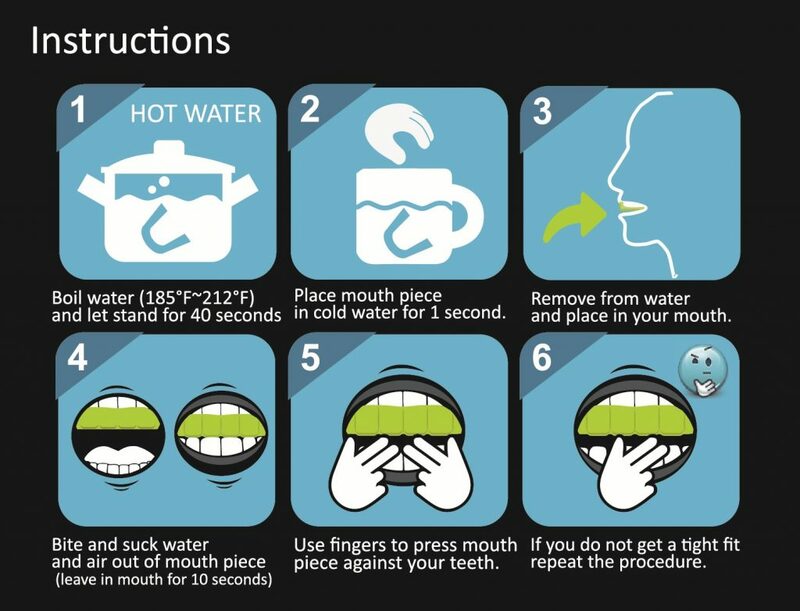 The last step is placing your mouth guard in ice water. You can remove your mouth guard and then, you can dank the mouth guard in the water. Let your mouth guard cool and then, you can fit it again. You should make sure that your mouth guard is naturally fitted both in the bottom teeth and in the top teeth. If there is still a strap, you can cut it off or remove it. You can try the mouth guard until you are fitted with it. How to mold a mouthguard with braces? After you have already known about the ways of molding a mouth guard, in this sub-topic, I will give you the way how to mold the mouth guard with braces. When it comes to molding the mouth guard with braces, it is slightly different with the regular mouth guard. Nevertheless, It does not mean that you could not mold your mouth guard with braces by yourself, here are some steps which can be conducted if you want to mold it with braces. The first step when you want to mold your mouth guard with braces is ensuring the right size. For example, if you are children with age under 12, you can choose the mouth guard with small or medium sizes. If you are an adult, you need to look for the mouth guard with the large size. After you are choosing the right size for your mouth guard, the next step is preparing the barriers between the guard and the bracket. When you submerge your mouth guard in the boiling water, the hard polymer material will be softening and pliable. In this condition, your mouth guard is able to bond with dental brackets in your mouth. You can use a foil or wax barriers between the bracket and the guards. You can use the barriers while you are in fitting process. Then, you can use the mouth guard firmly over the braces while practicing or trying. In the process of molding a mouth guard with braces, it is better to work with the professional dentist. Braces belong to an investment both in time and in money, of course you need to conduct the process correctly. Working with the dentist or orthodontist is very helpful especially in the critical process when your teeth are adjusted. They will give you the alternative solution so that the process of molding a mouth guard over the braces. When your teeth are shifted during the process, you can re-adjust your mouth guard into your mouth. For your information, the mouth guard usually can be removed for up to 20 times. Because of that reason, you can use it multiple times until it is fitted firmly in your mouth. You can also use the boiling water if you are going to re-shape the mouth guard. How to remold a mouthguard? As mentioned in the previous part, a mouth guard belongs to one of the important and essential decives for the athletes of contact sports. In some countries, this type of device is a must to be used while they are playing and competing the sport which involves players’ contact. The mouth guard is so important in protecting the teeth and the other vital organs which can be damaged in the contact sport. When it comes to the remolding a mouth guard, there are some materials that you should prepare. Firstly, you need to prepare a pot of boiling water. The boiling water is used to submerge and drop in your mouth guard. After dimming in the boiling water, you can let your mouth guard simmer for about 30 seconds. After that, you can remove it from the boiling water and you, then, can submerge it again in the a pot of cold water for about 5 seconds. You may dip in more than 5 second, but it is the standard time that you should apply to make your mouth guard pliable. If the boiling time more or less, it will make you difficult to remold your mouth guard. If you have the exceeded boiling time, it also will make your mouth guard melting. Because of that reason, you should watch and consider the proper boiling time for your mouthguard. After you submerged your mouth guard in the boiling water, you then can dip in the cold water. The purpose of cold water is to get the proper temperature of a mouth guard so that the temperature can be stable and tolerable. After having 5 seconds for dipping in your mouth guard in the cold water, you can remove it and fit it in your mouth quickly. You can bite down your mouth guard for a minute in order to remold it based on your teeth and your mouth. Remember, you do not need to taste the flavor. After minutes, you should take out the remolded mouth guard and dip in it in the cold water again. Let it simmer for about 5 minutes o have the complete cooling and here are you have already remolded your mouth guard. How to clean a mouthguard? When it comes to a mouth guard, this device is useful for protecting your teeth especially in the contact sports. This device can be worn frequently and of course, this device needs to be cleaned. Cleaning the mouth guard is important because it can be easily contaminated with plaque and calcium which can deposit most of bacteria. How to clean the device? There are some methods which can be used when you want to clean your mouth guard. They are using gentle soap, using bleach, and using denture cleaner. You can use the toothbrush when you want to clean your mouth guard. Nevertheless, you could not use the toothbrush which has already been used for your teeth. you can look for the new hard bristled one. After that, you can put a little soap on your mouth guard. As alternative choice, you can also hand soap or anti bacterial soap for cleaning it. Then, you can use the lukewarm water and then you can brush the mouth guard gently. You can pay more attention in the part where the plague exists. After that, you can rinse your mouth guard in the warm water; you need to ensure that there is no soap left anymore. You should rinse it well in order to avoid unpleasant irritation when you bite down the mouth guard. After that, you can swap the mouth guard and then you can put it into its case for keeping your mouth guard clean and protecting it from unpredictable damages like: pets which often lick or even chew something. Besides using gentle soap, you can also use bleach when you are going to clean your mouth guard. You can make the bleach as your solution. You can use a little bleach on a bowl of water. Remember, you cannot use bleach if you have allergy to any kinds of bleach. Besides that, If you are going to use a bleach to clean your mouth guard, you should use the gloves in order to keep your hand from damaged. You can soak your mouth guard for five up to ten minutes in order to remove all of the plaque and bacteria which can exist in the mouth guard. You also cannot use the bleach twice or more. After that, you need to make sure to rinse all of the bleach from your mouth guard. You need to ensure that the bleach should be gone. The bleach is also harmful if you are not well in rinsing your mouth guard from the bleach. Another method that you can do in cleaning the mouth guard is using denture cleaner. The steps that you can do are purchasing denture cleaning tablets. You can fill a bow of water by using a tablet of denture cleaning. You can dip it for about 5 up to 10 minutes and then you can remove your mouth guard. Remember, you do not need to rinse it all the day because it will be harmful. After that, you can rinse the mouth guard in the bowl and make sure that there is no denture cleaner existing in your mouth guard.